Providing an opener to the Watkins Glen race weekend for the NASCAR tour, the 2010 Nationwide Series' Zippo 200 warms up the suburb's 2.45 mile road course. An 82 lap event, victory at the NASCAR Nationwide Series event is significant since the Zippo 200 is only 8 laps shorter than the NASCAR Sprint Cup race running Sunday. For this reason and the chance of catching the NASCAR regulars off-guard, the 2010 edition of this race brought out a slew of road racing experts including Ron Fellows, Nelson Piquet Jr, J.R. Fitzpatrick and Jacques Villeneuve. A road racing ringer with the distinct honour of being a full season NASCAR Sprint Cup driver, the talents of Marcos Ambrose in a stock car was too much for his Sprint Cup JTG Racing team to ignore. Winning the 2 previous Nationwide series events at Watkins Glen, the Tasmanian driver was offered an opportunity to 3-peat at the race track against fierce competition from road ringer and other moonlighting Cup series driver. As the team fields a #47 Zippo-sponsored Toyota, Ambrose still preserved memories of the Sprint Cup race that got away from him at Infineon Raceway (If Marcos was ever able to forget it, someone with the media who be certain to remind him of the Sonoma mishap throughout this weekend). Winning pole for the upcoming race served as effective therapy to setting the past in the past. On Saturday afternoon, the present effects the Zippo 200 started as 43 cars jockeyed for position off the start. Making contact into the first corner through the drop of the green flag, two Sprint Cup regulars came together for what would be the beginning of an eventful race at the Glen. The #60 Roush-Fenway Racing Ford driven by Carl Edwards brushed the side of the #33 Chevrolet owned and piloted by NASCAR Sprint Cup point leader Kevin Harvick. With minor damage applied to each race car, both cars continued while Marcos Ambrose led what would be the first 18 circuits around the track. Under the first run, Edwards encountered the worst racing luck as his #60 Ford began to develop an engine issue. While the Roush-Fenway Racing team were determined to keep Edwards in the race, this would eventually prove a losing cause as the Ford was forced out of the Zippo 200 after completing 27 laps. With Carl Edwards out of the Watkins Glen event, this retirement cost the driver a 3rd straight road course win in NASCAR Nationwide Series competition. A full-course yellow flew on lap 21 for debris following a first round of pit stops. Prior to this, the #33 of Kevin Harvick was served with a speeding penalty which dropped the top 5 car to rear of the NASCAR Nationwide field. Though Harvick would be able to climb back up the running order, he would not be a formidable match for the leading trio of Toyotas. On the lap 23 restart, for the first caution at Watkins Glen, Joey Logano led for what would be a very short green flag run as a major crash out of turn 1 amounted to a massive 10-car wreck. Started when the #38 of Jason Leffler went wide of the first corner, his attempt to rejoin the pack resulted in contact with the #16 car of Colin Braun setting off a chain reaction within the narrow, guardrail-lined area of track. Trevor Bayne, Justin Allgaier and Brendan Gaughan are only a few participants involved in the melee. As drivers Steven Wallace and Kevin Harvick avoided serious damage through evasive actions on track, Roush-Fenway Racing development driver Billy Johnson's #6 Ford failed to slow down significantly when he collided with the stalled Chevrolet of Tony Raines. Drilling Raines, Johnson lifted the #34 Chevrolet on top of the #6 Ford. A 25 minute red flag period was required to remove the derelict race cars and repair the Armco retaining barriers. Restarting the race after what would prove to be the only multi-car wreck, Joey Logano's #20 Toyota would be passed by teammate Kyle Busch on lap 27 leading for 14 laps until the #47 of Marcos Ambrose applied pressure on the Joe Gibbs Racing driver. Through an aggressive move heading into the inner loop chicane between turn 4 and 5, Ambrose used lapped traffic to his favour. As Busch's #18 Toyota slowed to pass the slower cars, the #47 Toyota practically drove flat-out storming to the lead. Taking the lead back on lap 41 with this move, Ambrose retained the top position for the remaining one-half distance. With Marcos Ambrose holding the lead even as two cautions bred for additional double-file restarts, the fight within the top 10 was alive. Losing 2nd to Logano, Kyle Busch was loathing his race car falling to 5th place as he received the checkered flag. Having also passed Busch, Kevin Harvick achieved a hard-fought 3rd place effort as he hustled from deep in the pack and averted the multi-car wreck to gain the podium spot. Enjoying good days within the NASCAR Nationwide series are several of the part-time road racers. 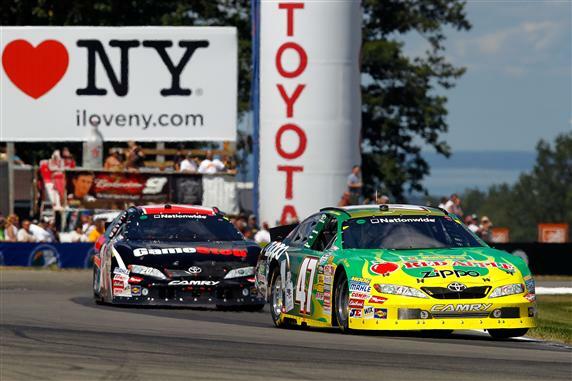 As Ambrose celebrated in Watkins Glen victory lane, Ron Fellows brought the #88 JR Motorsports Chevrolet home 6th while his Canadian teammate J.R. Fitzpatrick would also recover from a late race spin to finish 11th. Former Formula 1 drivers Nelson Piquet Jr as well as Jacques Villeneuve finished inside the top-10 with Piquet finishing 7th and Villeneuve placing in position behind. A benefactor from Carl Edward's mechanical woes, NASCAR Nationwide series points leader Brad Keselowski would see the gap grow to 327 markers over his closest competitor Edwards.